The VT State E-Cycling Law went into effect on Jan 1st, 2011. It bans the disposal of all electronic devices in the state’s landfills. See a complete list of items banned from Vermont landfills. Visit the Vermont Agency of Natural Resources website for more information about the Vermont State E-Cycling Law. 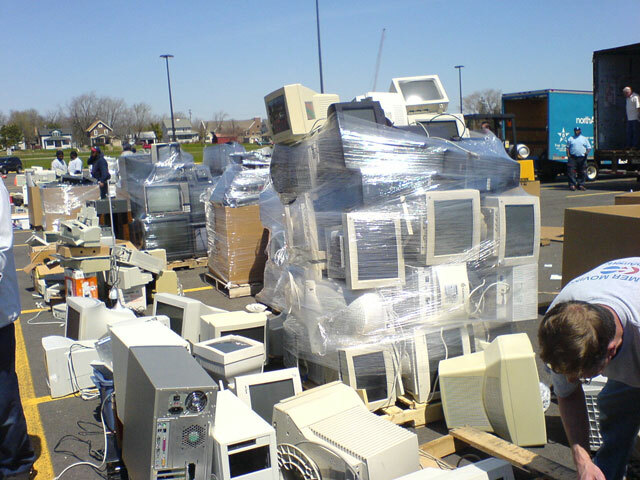 Electronic waste–televisions, computers, gaming systems, phones and other household electronics–are an increasing percentage of the solid waste stream. Electronic devices contain many hazardous materials such as lead and brominated flame retardants; they should not be disposed of in landfills. To properly recycle your electronics, bring them to our North Hero, Bakersfield, Montgomery, or Georgia sites during regular business hours. Televisions, computers, and computer peripherals are accepted FREE of charge. View a list of fees other electronics. Staples, in Highgate Shopping Plaza in St. Albans, also accepts electronics for recycling. Call (802) 524-0700 for more information. For information on purchasing environmentally friendly electronics, visit EPEAT and take advantage of their Electronic Products Environmental Assessment Tool.